In California, every project approved by the state begins with a detailed look at the distant past of any future route, looking deep into a history that pre-dates our modern conveniences. The Cultural Studies Office at Caltrans, California’s highway, bridge, and rail agency, is made up of archaeologists, historians, and architectural historians who study the landscapes being considered for new projects, hoping to protect the heritage of what came before. Excavating at the Coast Guard Commander's House on Yerba Buena Island, half-way between Oakland and San Francisco. Prior to actually breaking ground, the department will do field-testing to research the site and determine its sensitivity, including the potential for buried artifacts, by poring over old maps, performing soil and geological surveys, and consulting architectural databases, both on-site and online. Subterranean studies are done using Lidar, geophysical remote sensing, and magnometers, which send ground-penetrating radar pulses into the soil to detect detect anomalies and identify potential burial locales. The range of assignments keeps the department busy, operating unofficially on what Medin refers to as the 80-20 rule. Non-invasive civic updates, like pavement re-striping, are common—in fact, the majority of cases—but they are also relatively quick to handle. The remaining percentage of projects—the 20%—is smaller, but their scale makes them significantly more time-consuming. “These are the big hairy furballs,” she joked. 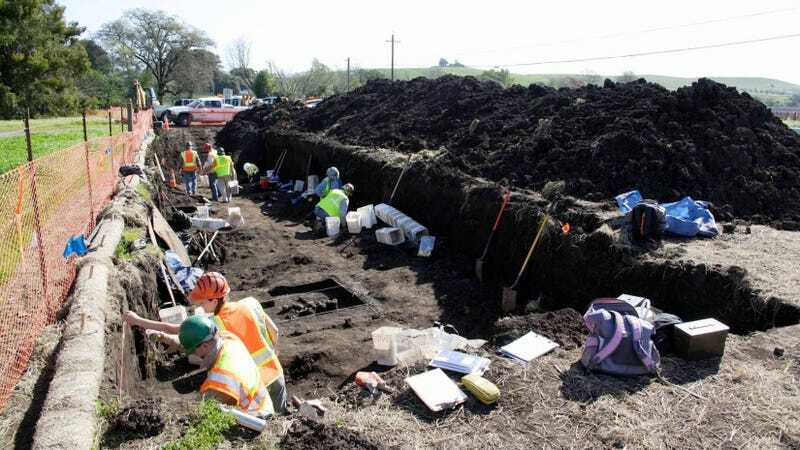 Caltrans archeologists hard at work recording artifacts at the Duhig Road Project in Napa county. One of largest recent endeavors has been the large-scale seismic and structural reconstruction of San Francisco’s Doyle Drive, a nearly 80-year-old roadway that provides access to the iconic Golden Gate Bridge. The surrounding Presidio is a national historic landmark and home to San Francisco’s National Cemetery, a site for Army burials since the late 1800s. Preserving the area was imperative, so what even Caltrans describes as “huge retaining walls” were built in order keep the final resting place intact and to maintain its place as a significant spot for both the area and the nation. Additionally, the original fence was salvaged and restored. “This was a great example of archaeological teams working together to create a better project,” she says. The historic fence from the National Cemetery in San Francisco's Presidio. The fence being re-erected after the surrounding construction was completed. Another major project has been the much-publicized, long-time-coming Bay Bridge east span, which opened last month. “When projects really impact the public like that, we like to give something back, for restitution,” she says. In this case, funds were donated to the Oakland Museum for Above and Below: Stories From Our Changing Bay, a special exhibition dedicated to sharing knowledge about the area’s once was, what is, and what will be—a fitting display for the office’s efforts. The foghorn from the Bay Bridge at the Oakland Museum's Above and Below exhibition, courtesy of the Caltrans. Caltrans continues to peel back the surface of California to reveal ancient sites tucked away underground, landscapes most people never knew were even there. To some, it may seem like an unexpected speciality for the folks donning day-glo vests along ripped up transit lanes all over the west coast; but the refinement they bring to these otherwise massive endeavors is an essential step in re-discovering our hidden cultural heritage. Lead image: Data recovery excavations at Duhig Road.